This autobiography was first published as a 6-part series in the ELECTRICAL EXPERIMENTER magazine, February-June and October, 1919 issues. 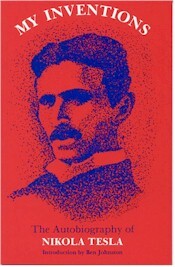 The series was republished as MOJA PRONALASCI - MY INVENTIONS, Skolska Knjiga, Zagreb, 1977, on the occasion of Tesla's 120th anniversary, with side-by-side English and Serbo-Croatian translations by Tomo Bosanac and Vanja Aljinovic, Branimira Valic, ed. In addition to an 18 page introduction by Ben Johnston, this work is divided as follows: I. My Early Life; II. My First Efforts In Invention; III. My Later Endeavors; IV. The Discovery of the Tesla Coil and Transformer; V. The Magnifying Transmitter; VI. The Art of Telautomatics. At the age of 63 Tesla tells the story of his creative life. The online version of My Inventions. The progressive development of man is vitally dependent on invention. It is the most important product of his creative brain. Its ultimate purpose is the complete mastery of mind over the material world, the harnessing of the forces of nature to human needs. This is the difficult task of the inventor who is often misunderstood and unrewarded. But he finds ample compensation in the pleasing exercises of his powers and in the knowledge of being one of that exceptionally privileged class without whom the race would have long ago perished in the bitter struggle against pitiless elements. . . . When I get an idea, I start at once building it up in my imagination. I change the construction, make improvements and operate the device in my mind. It is absolutely immaterial to me whether I run my turbine in thought or test it in my shop. I even note if it is out of balance. There is no difference whatever; the results are the same. In this way I am able to rapidly develop and perfect a conception without touching anything. When I have gone so far as to embody in the invention every possible improvement I can think of and see no fault anywhere, I put into concrete form this final product of my brain. Invariably my device works as I conceived that it should, and the experiment comes out exactly as I planned it. . . .
. . . a few years hence, it will be possible for nations to fight without armies, ships or guns, by weapons far more terrible, to the destructive action and range of which there is virtually no limit. Any city, at a distance, whatsoever, from the enemy, can be destroyed by him and no power on earth can stop him from doing so. If we want to avert an impending calamity and a state of things which may transform the globe into an inferno, we should push the development of flying machines and wireless transmission of energy without an instant's delay and with all the power and resources of the nation. ""Lionhunters" have often asked me which of my discoveries I prize most. This depends on the point of view. Not a few technical men, very able in their special departments, but dominated by a pedantic spirit and nearsighted, have asserted that excepting the induction motor I have given to the world little of practical use. This is a grievous mistake. A new idea must not be judged by its immediate results. My alternating system of power transmission came at a psychological moment, as a long-sought answer to pressing industrial questions, and altho considerable resistance had to be overcome and opposing interests reconciled, as usual, the commercial introduction could not be long delayed. Now, compare this situation with that confronting my turbine, for example. One should think that so simple and beautiful an invention, possessing many features of an ideal motor, should be adopted at once and, undoubtedly, it would under similar conditions. But the prospective effect of the rotating field was not to render worthless existing machinery; on the contrary, it was to give it additional value. The system lent itself to new enterprise as well as to improvement of the old. My turbine is an advance of a character entirely different. It is a radical departure in the sense that its success would mean the abandonment of the antiquated types of prime movers on which billions of dollars have been spent. Under such circumstances the progress must needs be slow and perhaps the greatest impediment is encountered in the prejudicial opinions created in the minds of experts by organized opposition." ""The 'World-System' has resulted from a combination of several original discoveries made by the inventor in the course of long continued research and experimentation. It makes possible not only the instantaneous and precise wireless transmission of any kind of signals, messages or characters, to all parts of the world, but also the inter-connection of the existing telegraph, telephone, and other signal stations without any change in their present equipment. By its means, for instance, a telephone subscriber here may call up and talk to any other subscriber on the Globe. An inexpensive receiver, not bigger than a watch, will enable him to listen anywhere, on land or sea, to a speech delivered or music played in some other place, however distant. These examples are cited merely to give an idea of the possibilities of this great scientific advance, which annihilates distance and makes that perfect natural conductor, the Earth, available for all the innumerable purposes which human ingenuity has found for a line-wire. One far-reaching result of this is that any device capable of being operated thru one or more wires (at a distance obviously restricted) can likewise be actuated, without artificial conductors and with the same facility and accuracy, at distances to which there are no limits other than those imposed by the physical dimensions of the Globe. Thus, not only will entirely new fields for commercial exploitation be opened up by this ideal method of transmission but the old ones vastly extended. . . .""
"My belief is firm in a law of compensation. The true rewards are ever in proportion to the labor and sacrifices made. This is one of the reasons why I feel certain that of all my inventions, the Magnifying Transmitter will prove most important and valuable to future generations. I am prompted to this prediction not so much by thoughts of the commercial and industrial revolution which it will surely bring about, but of the humanitarian consequences of the many achievements it makes possible. Considerations of mere utility weigh little in the balance against the higher benefits of civilization. We are confronted with portentous problems which can not be solved just by providing for our material existence, however abundantly. On the contrary, progress in this direction is fraught with hazards and perils not less menacing than those born from want and suffering. If we were to release the energy of atoms or discover some other way of developing cheap and unlimited power at any point of the globe this accomplishment, instead of being a blessing, might bring disaster to mankind in giving rise to dissension and anarchy which would ultimately result in the enthronement of the hated regime of force. The greatest good will comes from technical improvements tending to unification and harmony, and my wireless transmitter is preeminently such. By its means the human voice and likeness will be reproduced everywhere and factories driven thousands of miles from waterfalls furnishing the power; aerial machines will be propelled around the earth without a stop and the sun's energy controlled to create lakes and rivers for motive purposes and transformation of arid deserts into fertile land. Its introduction for telegraphic, telephonic and similar uses will automatically cut out the statics and all other interferences which at present impose narrow limits to the application of the wireless. . . ."